Earlier this year, I had the opportunity to visit a development site in East Brunswick when the earthworks were in progress. The scene was almost post-apocalyptic, with enormous bluestone boulders being dug out and loaded onto huge trucks, some for recycling as pavers to be used in the development, others for the crusher. It was a great backdrop for a shoot, albeit very hot, dusty and requiring fast footwork to dodge the heavy earthmoving equipment and the continuous fleet of trucks. There was a tight deadline as the site was to be cleared within a couple of weeks. I was not sure what to shoot until I found a large boulder which had a basic house shape. Armed with a few tins of spray paint and some plastic flowers, the rock was soon transformed into a very organic little single fronted house in a community of other unpainted rocks. As the images emerged I was reminded of Noddy, one of my childhood faves. The series is a metaphor for life and the randomness of our tenure. It is evocative and whimsical. While painting the rock, many of the neighbours in the adjoining apartments came out onto their balconies and shouted encouragement. One very generous couple let me take some aerial shots of the site and “Noddy” from their balcony. The men using the earth moving equipment were incredibly helpful. They lent a ladder so that Noddy’s roof could be reached. The rock itself weighs about a ton and is around 6 feet tall. They very dexterously picked him up in the shovel for a shot and then carefully dropped him onto his side for another. I must say he looked abandoned on his side. The next day I received an email from distressed neighbours in the adjoining apartment asking what had happened to him. It is amazing how this rock has captured the hearts of the local community. Even the truckies paid their respects to Noddy’s house, beeping on arrival and departure. View of the morning after - Noddy on his side. Familiarity and Contempt - The Same Old Story? "Familiarity is a magician that is cruel to beauty but kind to ugliness." It speaks to the notion that the way we see, is shaped by the frequency of the view and implies a downgrade over time; a kind of visual fatigue. I can hear that old song by the Righteous Brothers playing in the background - "You've lost that lovin' feeling', Now its gone, gone, gone...........". The opportunities for a great shot are exciting and abundant the first time around. However, it is so disappointing to re-visit a much-loved destination and find that the photos from one year to the next start to look the same - a bit like that love affair! It is therefore a worthy challenge to find different ways of seeing the same thing; to bring fresh eyes to the scene, and a return of the excitement of something new. I am fortunate to have travelled to Vienna on many occasions. It is a very beautiful monumental city, rich in art & culture. The spare sophistication of the Secessionists & the Wiener Werkstatte is spectacular in black and white and often depicted that way. So for my new view, seeking a departure from the usual, I took a walk in the early evening. Watching the city, redolent in glorious colour, unwind from the day, I experienced a return of that "lovin' feeling"! The Barai Spa at the Hyatt Regency Hotel in Hua Hin Thailand is truly uplifting. I am not trying to give free plugs here, but the beauty of the building contributes much to the whole experience of the spa. The design was inspired by the Baton Temple in Cambodia's Angkor. Barai is named after "Barays", the large man-made reservoirs created by the Khmers to channel irrigated water for their daily use, believed to be the life arteries providing wellbeing and healing. The spa complex is an extraordinary interplay of thick walls, repeating corridors, earth colours, lightness, dark, and water. A trip to a "treatment" at the spa winds around corridors of thick walls, moving up & down small steps in semidarkness & quiet. The trip is punctuated by sunlight streaming through fissures in the walls & ceilings strategically placed to highlight design features. In transit one loses all sense of direction & the outside world - the experience imposes mindfulness - awareness only of the here & now, a great prelude to a relaxing massage. There is something almost miraculous about the sun, sand, and sea. After a grinding year of work & play, a bit of beach time seems to lift the spirits and restore the soul. It probably also helps to have no schedule and no requirement to cook or clean! Even so, sand between the toes, salty air, and a blue horizon makes the everyday just melt away. 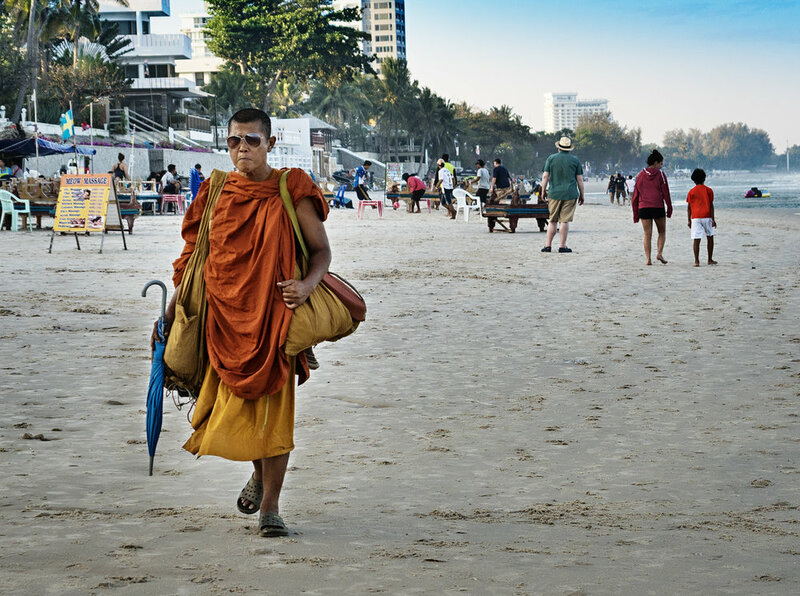 Clearly this is a common philosophy, as here in Hua Hin, people from all walks of life step out for a daily constitutional. 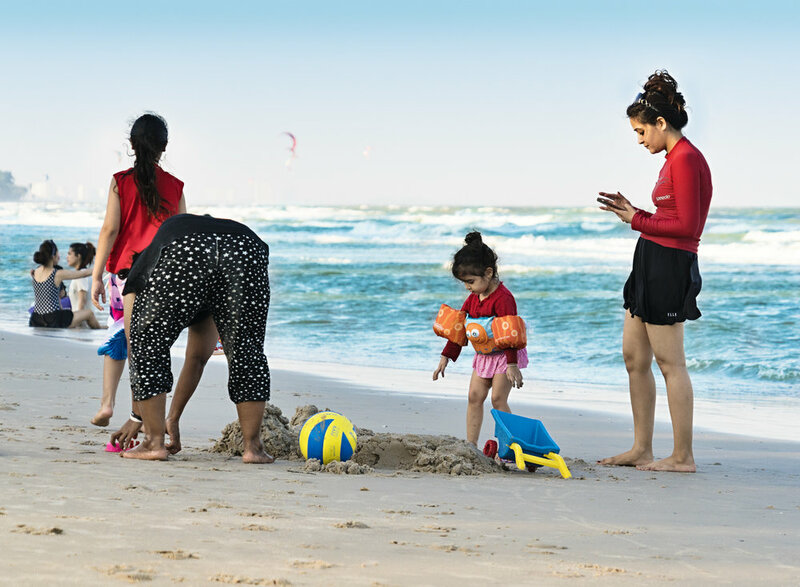 Anything goes on the beach - from style and self absorption, to real "Martin Parr" moments of families with their kids. Because of the tidal peculiarities, a beach walk is restricted to the golden hour in the evenings, returning to the hotel gardens for dusk - a photographers dream time. So I reflect on another decade on the clock (yes, a big birthday has come & gone) & look forward to a new year as a senior with renewed vigour & curiosity. I have had a very exciting weekend in various galleries with stunning contemporary paintings for company. I was especially impressed with a wonderfully tongue-in-cheek painting, "Art Work" featuring a picture in a picture in a picture, by Australian artist Tony Irving. (www.tonyirvingartist.com) It depicts " The Banquet of Cleopatra" (Tiepolo. NGV) complete with craquelure and a copyist standing at his easel. It was a weekend of serendipity as we discovered another contemporary Australian artist, more in the surrealist genre, Tom Alberts, who has, himself, been a copyist at the Louvre. He gave an interview to the daily review in which he describes the experience. Being allowed to copy a work in the Louvre is a rare privilege, and one granted only to established artists. After an interview, submission of a CV, images of works and a letter explaining why he wanted to make a copy, Tom received permission. There are strict rules about copy painting; His canvas had to be 5cm larger or smaller than the original, placement of the easel & materials was limited, and public safety requirements had to be observed. He was not permitted to leave his easel except for toilet breaks. He worked 4-5 hours, 4 days a week alongside several other copyists. Interestingly, the Louvre administration did not critique the work. Visitors to the Louvre were able to watch the process. He got to keep his copy and has hung it in his home. Chardin, an 18th century French painter established and formalised the system of copying paintings in the Louvre with a limited number of easels available. Each copy is assigned a number and entered into an official registry - quite an honour for those awarded access. Interestingly Tom chose a Chardin painting to copy. Clearly, reproduction of another's image outside of the formal "copyist" genre is plagiarism, the scourge of art. To copy a painting requires substantial painting prowess and plenty of time. On the surface, it may seem different for photographers since some think we simply push a button. Obviously, there is a lot more to it than that! However, one of the most enjoyable and informative ways to learn photographic lighting techniques is to try to copy the work of others. 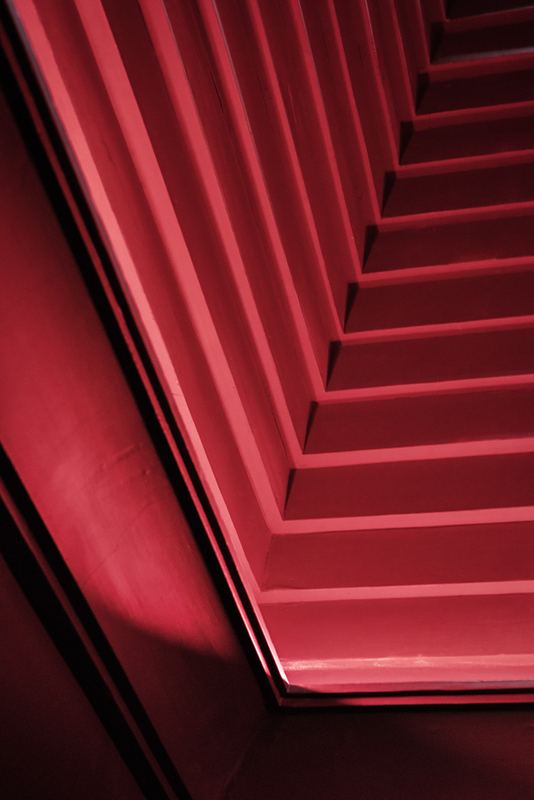 With the understanding of how the quality, intensity, colour, and direction of light contributes to the image, we are better able to develop a personal style and adapt lighting techniques to re-interpret the world through the lens. "Learning by doing" in this way is a powerful tool. Perhaps we should take a leaf from the canvasses of our painterly colleagues and formalise the copy process - what's good for the goose.............. and a trip in the footsteps of the photographic masters would not go astray! "This exhibition celebrates the visual links between early photography and British art, bringing together fascinating vintage photographs and stunning paintings including Pre-Raphaelite, aesthetic and impressionist works. Spanning 75 years across the Victorian and Edwardian ages, the exhibition showcases the experimental beginnings of photography right through to its flowering as an independent international art form. These are displayed alongside the paintings which they inspired and which inspired them. This is the first time works by John Everett Millais, Dante Gabriel Rossetti, JAM Whistler, John Singer Sargent and others will be shown alongside photographs by pivotal early photographers such as Julia Margaret Cameron and Alvin Langdon Coburn." I had one of those "Dah to self" moments because I hadn't really thought about artists using early photography as an "aide memoire", as is done so frequently these days. But of course they would have been seduced by how easy it was to capture the likenesses. It must have saved so much time & money compared with the detailed working sketches/paintings & the multiple sittings necessary before the development of photography. The images were fascinating - Here are a few. Just before leaving for London I had been experimenting with Jill Greenberg-style lighting demonstrated so elegantly, if controversially, in the series "End Times". My model is herself an aspiring painter. After I had returned, & much to my delight, she sent me her self portrait, aided by my photograph. It was an interesting collaboration, albeit very humble in the face of the past & present masters. Interestingly Jill Greenberg has just done a series of photographs of paintings entitled "Paintings" turning the tables on painters who use photography as their source material. Psychology is a powerful marketing tool. It seems to me that if you call the referendum Brexit you are implanting the seed of leaving right at the start. For all of those who wanted to stay, why didn't they fight about the name of the process up front? The nation is in shock, divided, & London, a truly cosmopolitan child of the world is reeling. More than 55,000 took to the streets of the City of London marching from Marble Arch to Trafalgar Square expressing their disappointment. What will happen to us now was shouted from every corner. The home made signs say it all - we want to stay! It is almost a year since my mother died. I am holidaying with my family in China. We were in Beijing at the summer palace rebuilt by the dragon empress - a fearsome regent for the last couple of childling emperors. She was a tiger mama if ever there was one! In a dragon boat on the lake, the air was thick & we were in a cocoon, not able to see the shore. It was hot but the breeze was cool. I was drawn to all the mothers with their children. No surprises there! They appeared almost heavenly against the glowing white of the hazy sky & I was a brief intruder into their intimacy. I too am a mother, but even when I need to, I can no longer just be a daughter. This duality was precious. I miss my mum. I have been focussing my photographic attention on dolls for quite a while now. They are uncomplaining, co-operative & many seem to take on quite a personality. They don't talk back! I like working with them. Many photographers have used dolls to express their narratives - Cindy Sherman, Hans Bellmer, Louise Bourgeois, Gregory Crewdson, David Levinthal, Ralph Eugene Meatyard, Dare Wright, Loretta Lux, Morton Bartlett, to name a few. Their work is powerful, & on the whole, transcends the mere fact of the inanimate object as the surrogate subject. Knowing this, I was shocked to find how many friends & colleagues, even my own family, find dolls creepy & some even frightening. Pediophobia is the unwarranted, irrational and persistent fear of dolls. It is a specific phobia belonging to the category of ‘automaton phobia’. This is a type of phobia where the individual is afraid of all humanoid or “human-like-but-not-quite” objects including mannequins, marionettes, ventriloquist’s dummies, wax figures, animatrix or robotic figures etc. The word Pediophobia originates from ‘Paidion’ which means ‘little child’ in Greek and ‘Phobos’ meaning fear or deep dread. I guess I have pediophilia because I like them. Careful, now, how you say that! In my search for suitable dolls to photograph, I have discovered a whole new world - grown-ups who collect dolls & the gobsmackingly enormous range available. My first series with dolls, "Thinking about the Master & Disciple - Joel Peter Witkin" used antique broken dolls. Collectors of modern dolls go for BJD's - ball jointed dolls. On the whole the collectors are women. Many are professionals, buying eyes, wigs, clothes for custom-made ball jointed dolls, having parties for them, matchmaking for them. There are gay versions. There are even BJD congresses to attend with makers, vendors, collectors & the whole shebang in attendance. Why do they get hooked? Nordette Adams in her blog talks about collecting & refers to an article in Psychology Today , where psychiatrist Richard Gottlieb, M.D. connects the dots from collection to loss. "At heart, collecting has to do with the prevention of loss, which is a universal and painful part of the human condition," Gottlieb observes. "It's an effort to stop time in its tracks, to hold on to things and the people that they symbolically represent, to make us feel less stricken and alone." It is possible, I suppose, that collectors of BJDs want to hold onto childhood - lost youth, lost beauty, lost innocence, the protection of family - & keep it safe. It is conceivable that they live vicariously through the fantasies they create for their dolls as they did when they were children. I am not in this realm of the serious collectors (yet!) The recent NYC exhibition by Flagart Foundation “Disturbing Innocence” resonated with the drivers of my current use of dolls in photography. The art is regressive, bypassing realism but nonetheless confronting. It evinces a place, our childhood, which is less toxic & aggressive, & allows a more direct depiction of difficult themes. Perhaps even the pediophobia, for those who have it, helps to convey the darkness. I am working on a series “Urban Playground. I admit to having fun dressing the dolls, but once they are wired/clamped into position & the work begins the “collectors fantasies” disappear. I have produced some images in the process of exploring the techniques I will employ. Here they are for your enjoyment . Pediophobes beware! I love to shop. I have that "take no prisoners, have no regrets" kind of attitude. 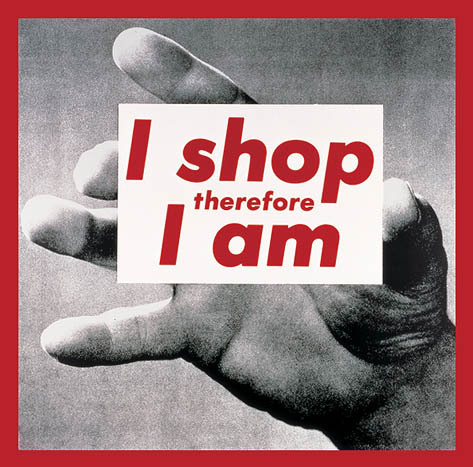 I liked the artist Barbara Kruger from the moment I saw her work "I shop therefore I am". It seems to say it all, even if it is rather editorial. Worrying about a companion on a shopathon leads to loss of focus & hasty decisions - or worse, the onset of responsibility, after which nothing is purchased. This is a particular problem when travelling - the fellow traveller cannot be left to their own devices for long (enough!). For this reason, I have found that my prowess is best when shopping alone & feeling good. Retail as therapy doesn't do it for me - the black is still there long after the parcels have been unwrapped. For many, it is fashion which floats the boat. For me, these days, a precision prime lens on a great camera, a fabulous light, even a whizz-bang piece of software, triggers the dopamine release & I fall in love all over again! Recognise a familiar pattern here? 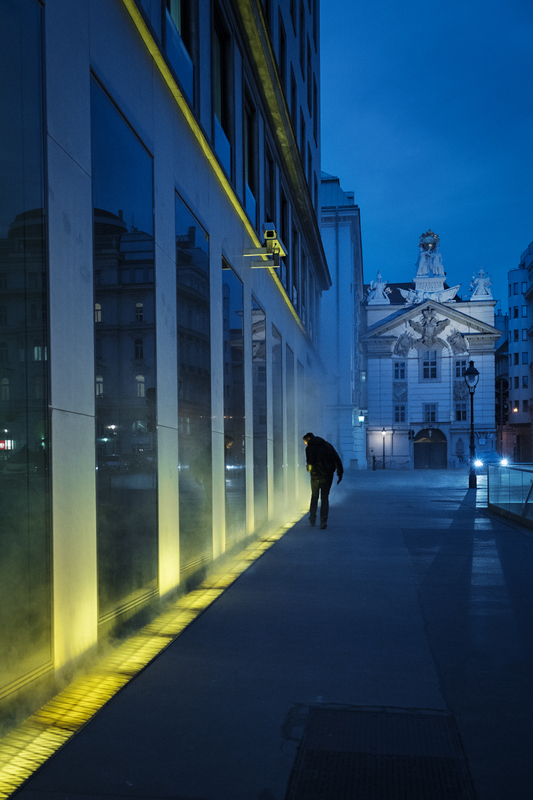 The high of a great shot, the obsessive pursuit of the perfect street scene/landscape/portrait/still life. Companions for the journey share many of the same frustrations, often without the comfort of a sofa/bed/chair found in a shop. We should make a global apology to all the long-suffering photography companions, & present a new opportunity for Barbara Kruger with alteration of only 2 letters! Life's a Beach at Venus Bay - My Birthday. I turned a year older than I care to think about last Saturday. It began inauspiciously as the temperature gauge hit 27C. It was only 7am. Sweaty & older, what a blast! The rest of the day was a real scorcher. We were staying at a coastal sleepy hollow called Venus Bay. Sounds romantic, but when the paint is melting, the air-con struggles to keep the living room below 30C, & the birds almost fly backwards it is anything but! It was too hot for the beach until late afternoon. Then they came out in droves, like marching ants, to find a cool breeze, catch a few sets on the turn of the tide, engage in some ancient caveman-style mating rituals on the sand, & let the kids rip. The storm clouds rolled in on sunset & the next battalion of Venusians arrived with their dogs, sadly banned until evening (I can almost hear the neologism already - we have sexist, racist, ageist & now probably dogist!). As usual the kids were the last to leave the water, silhouetted against the darkening skies like pixies. I was reminded of Rennie Ellis & his series" Life's a Beach " which chronicles 30 years of sun, surf & sand – the Great Australian Dream. He says "On the beach we chuck away our clothes, our status and our inhibitions and engage in rituals of sun-worship and baptism. It's a retreat to our primal needs." I had thought that I would snap off some pithy moments to commemorate the passing of another year, & with hot addled brain, only took a portrait lens on the pilgrimage to the beach. As the clouds gathered, the pithy moments morphed into capturing the amazing sky & I decided to flout convention & take portraits of the storm. The whole day was pretty primal, but Venus Bay did not disappoint, the earth finally cooled & I came to grips with another year on the clock! Xmas cards have been around forever but the origins of the modern version are to be found with Sir Henry Cole, first director of the Victoria & Albert Museum. Sir Henry would hand write greetings and best wishes to his family, friends, and acquaintances on sheets of paper decorated with Christmas themes or generic holiday cards. He found this inefficient, dare I say tiresome, and in 1843 commissioned a Christmas card with a single message that could be duplicated and sent to everyone on his list. The card was produced with the Words "A MERRY CHRISTMAS AND A HAPPY NEW YEAR TO YOU" written across the bottom half. This expression was to become the "standard' Christmas card message. Making cards is part of the anticipation & excitement running up to Xmas. I have had cards printed by big printers, Vista & the like, but it is hard to work in their colour gamuts & the finished product never seems to be as luminous & colourful as beautiful photographic paper. Some photographers print their photos & then attach them to cards to get around this problem. I love to print my own cards all in one & have done some "doozies" over the years. It is a challenge to find good thick hardy double sided photo paper which comes with printing profiles (I suppose one could always have a profile made specifically for the paper although it would be an expensive exercise for cards once a year). Canson Ragphotographique Duo 220GSM does a fine line of matt photo paper which prints, cuts & folds well. I have recently sourced some double sided gloss varieties but have yet to try them out - Permajet Oyster 285GSM double sided shows promise. Then there is the challenge of cutting them - my kingdom for a good guillotine! ( I am actually very happy with Rotatrim which has a very heavy self-sharpening blade & never seems to feather the edges - good solid & British made, just like Sir Henry. Glitter glue is also a fave - the least expensive but essential component. $2 shops seem to have the monopoly and the colour range increases every year. Keeping a steady hand & not allowing great gobs of glitter to form as you outline the all important part is the challenge! ( on my card the text is glittered in red so you need to use your imagination when viewing this post) Sir Henry was a bit lazy I fear - I like to write my own messages in addition to the standard. I still use snail mail to send them & look forward to opening our mail to find the treasures sent by friends & family. I love the ritual of stringing them up across the window as defacto decorations to be admired each day as we count down to Xmas. The art of sending Xmas cards seems to be dying, sadly. The next generation, joined at the hip to tablet technology, may ultimately have an entirely virtual Xmas. But the underlying premise of social media is not dissimilar to that of Sir Henry Cole in 1843. That said, this year, while I have again printed my cards & mailed them out, I have decided to join the "Sir Henry efficiency push" (& the next generation) & publish my card on line. Real paper & a bespoke card or cyber creation, the wish to all remains: Merry Xmas & my heartfelt thanks for your friendship & support over the year. A truckload of money : wouldn't it be nice! There was great hue & cry in 1904 when Edward Steichen's photograph The Pond Moonlight sold for $2.298 million at Sothebys. Many have followed in these huge money-laden footsteps. Cindy Sherman, untitled #96 in 1981 for $3.8905 million, Andreas Gursky, Rhein 11 1999, for $4.3885 million & now Peter Lik, Phantom apparently for $6.5 million, a new record. Each of these is accompanied by sharp in-drawing of breath from the community at large, & a big sigh of communal longing from the art photography fraternity. Steichen, Sherman & Gursky were sold through reputable auction houses therefore lending a sense of authenticity to the value, even though worth in this context is really only about what someone is willing to pay. Because Lik's work was sold privately & there is little evidence provided for the sale amount, the art mafia rails against his work & calls it's value into question. Even the credibility of the buyer is denigrated. The fact that he does the Bear Grylls thing, & is a consummate marketer probably doesn't help! He is painted as an upstart. And then he is Australian, & we do cut down our tall poppies! It is noteworthy that the origins of the saying "hue & cry" are to be found in English law; pursuit of a criminal immediately after he had committed a felony. Whoever witnessed or discovered the crime was required to raise the hue and cry against the perpetrator (e.g., call out "Stop, thief !") and to begin pursuit; all persons within hearing were under the same obligation, and it was a punishable offense not to join in the chase and capture. (The Columbia Electronic Encyclopedia, 6th ed. Copyright © 2012, Columbia University Press. All rights reserved) So, even the popular vernacular implies that acts for which there was hue & cry were somehow rip-offs. The logical conclusion to be drawn is that artists should somehow have to starve in a garret in order to produce meaningful worthwhile art - & further it should be given away, preferably to a person or institution with an impeccable art pedigree! For me, Sotheby's or Las Vegas, is not really the point. The point, I think, is that photographs are increasingly recognised as legitimate & collectable, to rival traditional art forms. For those of us with aspirations, even Peter Lik is doing his bit to raise awareness of the craft - in his case, the notoriety afforded by the bad press is probably as powerful a marketing tool as the quality of his work. The fact that he is laughing all the way to the bank, & is readily able to fund his passion, is enviable & no doubt the green monster contributes a little, or a lot to the outpouring of invective. Since I married for love, (& that avenue of wealth building is closed!) & look dreadful in the great outdoors, (a la Grylls), I am left to the tawdry existence of working at the day job (it's not actually tawdry at all!) & hoping that occasionally someone will take a look at my work & find it worthy..........but wouldn't it be nice! Actress Halle Berry is set to play an international jewel thief in the upcoming movie, Who Is Doris Payne? (The Life and Crimes of Doris Payne (2013) – IMDb) At nearly 80, Payne currently faces grand theft charges after taking the tags off a $1,300 Burberry coat and walking out of the store without paying, but her criminal career spans five decades. Her arrest comes after known heists and jail time for stealing a 5 ct diamond ring from a Neiman Marcus in Denver, an $8,500 ring in Nevada and a $31,500 ring in California. Payne had little use for violence. Her tools of choice have always been well-cut dresses, plain gold earrings, a silver tongue and a waiting taxi. Her goal was simple, she once told a reporter from the Associated Press: "I simply tried to cause the men to forget how many [rings] they would show me.” By the time a clerk counted up the rings, Payne was on her way to the airport! What wouldn’t you do for a beautiful jewel & the perfect little black dress? I recently photographed some beauties created by Neil Balthasar. Neil works from his atelier looking out over leafy Bourke Street Melbourne. His jewellery is breathtakingly beautiful - stylish & hand crafted. Each piece found its voice in a colourful narrative. The cover shot “Cosa Nostra” with its gorgeous tourmaline & diamond ring references ‘The Godfather” & consumerism in society. The series captures some of the tongue in cheek playfulness to be found in each creation. Photographing jewellery is not a walk in the park. 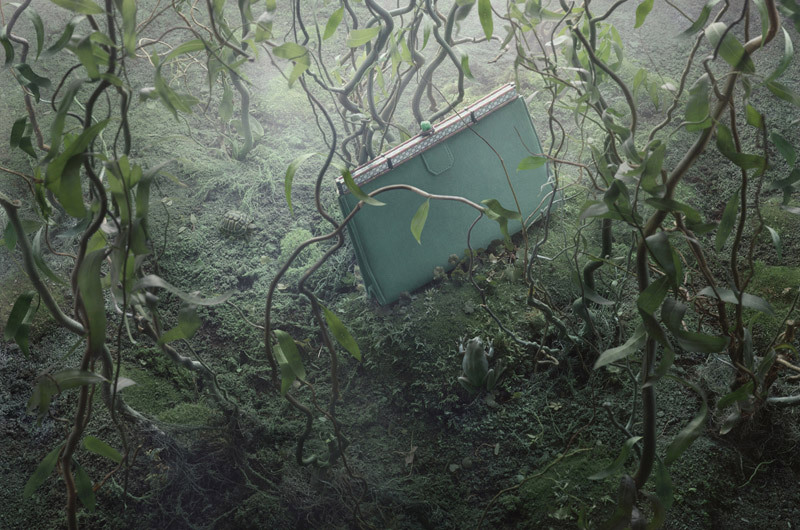 Peter Lippmann, Sebastian Gollings, Irving Penn were my guiding lights. Doris Payne eat your heart out! Have just created this website after much fighting with the software & myself. Don't know how I will use this blog but perhaps I can make it like a visual diary. Love Lippmann. Objects chosen compositionally perfect.